A cordless drill is that type of tool that should be a part of every DIYer, professional, hobbyist’s toolbox arsenal as it is an essential hand-held power tool designed for many home repairs and DIY projects. There are plenty of cordless drills in today’s market that has a broad range of capabilities, features, and price. 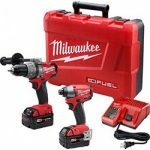 Our job is to make purchasing that tool easy and effortless as we share the pros and cons of each brand and model along with a handy cordless drill buyer’s guide at the end of this page. Here is a list of toolkits that we think are the top-performers. 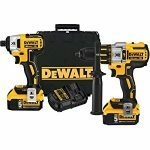 Here is the DEWALT DCK299P2 2-Tool Combo Kit that is superb in many drilling and driving applications featuring a brushless hammer drill and an Impact Driver for a powerhouse of tools to handle demanding jobs. The kit includes tools built compact for use in tight spaces. We like the Heavy-duty 1/2″ metal ratcheting chuck with the carbide inserts that provide users with stronger bit gripping on the DCD995 hammer drill. It also delivers 3-speed of high-performance 0-2000 RPM for faster application speeds. Q – Do the batteries have a fuel gauge? A – Yes they do. Q – Can I use a 20v battery from a different tool on these? A – Yes, as long as it is 20 volt rated you can use it. Q – Does it include the hard carrying case as pictured? Q – Can I use the hammer drill just like a regular drill? A – Yes, it includes 11 torque settings, a full drill, and hammer drill settings. 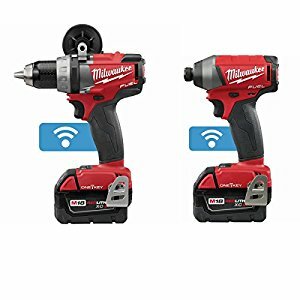 Tons of torque for a cordless drill and works terrific! Here is the Makita XT218M 18-Volt LXT Lithium-Ion Cordless Combo Kit, 2-Piece that is the industry leader in innovation cordless tool technology and this kit can tackle most driving, drilling, and fastening applications. The impact driver is lightweight weighing in at just 3.3 lbs without losing power with its 18-volt LXT battery giving ideal power-to-weight ratio reducing user fatigue which we like a lot. The hammer drill uses the same type of 18-volt LXT delivering 750″ lbs of torque handling tough drilling and driving applications. Q – Does the hammer drill have the capability of being used as a regular drill? A – Yes, it can do both hammer-drilling and drilling functions. Q – Can the impact driver be used for removing lug nuts from a car? A – No. It will wear the tool out quickly, look for an impact wrench. Q – How many batteries come with this kit? Q – Does the hammer drill have a removable handle? A – Yes it does. Here is the Porter-Cable PCCK602L2 20-Volt Max Lithium 2 Tool Combo Kit comes that includes a drill/driver and an impact driver, along with with the much-needed accessories that can power through some of the toughest wood drillings, fastening, and metal drilling applications. 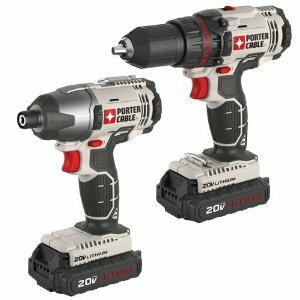 The drill/driver model PCC600 includes 330 units watts out (UWO), a two-speed gearbox of 0-400/0-1,600, a lightweight and compact design of 7.6 inches long and 3.8 pounds. We like the 1/2-inch metal ratcheting chuck for greater bit control. We also dig the fact that both tools include a battery fuel gauge that showcases the amount of charge remaining in the battery. These 20-volt Max Lithium-Ion batteries with 1.5 amp/hour cells deliver more power and runtime in a smaller package. Q – Will the charger keep the battery charged when not in use? A – Yes, it will keep the battery charged however it will stop charging to avoid overcharging the battery. Q – Can I adjust the speed? A – It is a variable speed trigger initiated. Q – Is there a level indicator on the tools? Q – Will the chuck accept 1/2″ drill shanks? 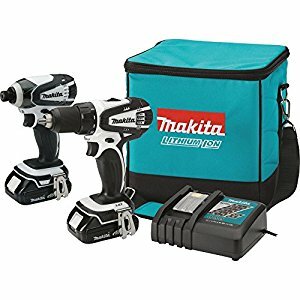 Here is the Makita 2797-22 M18 FUEL Cordless 2-Tool Combo Kit that comes with M18 fuel 1/2″ hammer drill and the M18 Fuel 1/4″ hex impact driver. It’s featuring the POWERSTATE brushless motor and the REDLINK PLUS Electronics intelligence a battery that runs 2x longer with the REDLITHIUM XC4.0 your jobs will run smooth and effortless with all that power. We like the brushless motor due to its noise-reducing qualities, and it cools down more rapidly. Q – How many batteries are included? A – Two Batteries that last a long time. Q – Is there a hard case or soft carrying bag? A – They sent a hard case. Q – Does the kit have a side handle? A – Yes! The handle is included with the kit and it’s removal and can be switched for left or right-handed use. Q – Can I use the impact driver to remove lug nuts? Here is the Bosch CLPK222-181 18-Volt Combo Kit that comes with the HDH181X Brute Tough hammer drill that uses (ART) Active Response Technology and an Impact Driver 25618. The ART will reduce the risk to injury from bind-up situation or a kickback. The onboard acceleration sensors will automatically turn the tool off when a potential torque reaction occurs that could be dangerous. 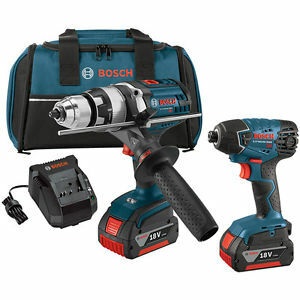 We love the great torque it comes with as the Bosch is engineered with a 4-pole motor that delivers 752 in. lbs of torque for efficient drilling when using a wide range of high torque bits like augers and spades. Q – Are the tools brushless? A – No, they use a brushed motor. Q – Does the hammer drill come with a concrete setting? Q – Is there a case for it? If so, a hard case or soft? A – It comes with a canvas carrying bag. Here is the DEWALT DCK240C2 20-Volt Combo Kit that is versatile and ready to take control over various driving and drilling applications. 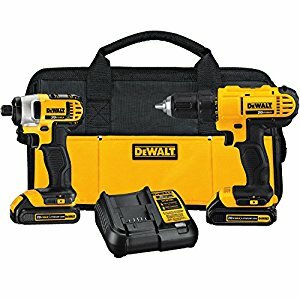 The drill/driver are both using the 20-volt Max system that is compatible with ALL of the 20-volt Max batteries which we like because of the money saving when building a tool collection. The tool offers one-handed loading 1/4″ hex chuck that accepts 1″ bit tips and features a 3-LED light ring with a 20-second delay to deliver visibility without shadows. Q – Does the LED light on the drill stay on continuously while drilling? A – Yes it does plus it has a 20-second delay. Q – Does it have a belt clip? Q – Does it have a separate key/Chuck or is it chuckless? A – It is chuckless. Q – Will the kit include the charger? A – The kit comes with the charger and two batteries. 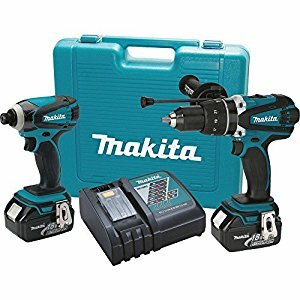 Here is the Makita CT200RW 18-Volt Compact Lithium-Ion Cordless 2-Piece Combo Kit engineered for the professional user who needs the best-in-class cordless tools within a compact body size for drilling, driving, and fastening without fatigue. The CT200RW features a compact and highly versatile 1/2″ driver-drill, along with with a powerful impact driver that is lightweight, at only 2.8 lbs. Each power tool powered by Makita’s 18-Volt Compact lithium-ion battery has the quickest charge time in its class, increasing productivity since the battery spends more time working and less time sitting on the charger minimizing downtime. Q – How many batteries are included with the kit? Q – Do the batteries have a fuel gauge to indicate when the charge is low? Q – Is it a brushless model? A – No, it’s a brushed. Q – Can the impact take wheels off a car? A – No, it’s not powerful enough for that task. Here is the Porter-Cable PCCK604L2 20-Volt Max Lithium 2 Tool Combo Kit comes that includes a drill/driver and an impact driver, along with with the much-needed accessories that can power through some of the toughest wood drillings, fastening, and metal drilling applications. The drill/driver model PCC601 includes 283 units watts out (UWO), a two-speed gearbox, 1450 in. lbs of torque, 0-2,800 RPM, 0-3100 BPM, a lightweight and compact design. We like the 1/2-inch chuck that gives the user greater bit control. We also dig the fact that both tools include a battery fuel gauge that showcases the amount of charge remaining in the battery. These 20-volt Max Lithium-Ion batteries with 1.5 amp/hour cells deliver more power and runtime in a smaller package. Q – Does the drill have clutch settings? A – Yes Low and high torque and 24 position slip clutch. Q – Is there a hammer setting for concrete? A – No hammer setting. Q – What’s the difference between the pcck602L2 & pcck604L2? A – The 602 model is more compact, and one as a battery fuel gauge indicator and the other doesn’t. Both great tools. 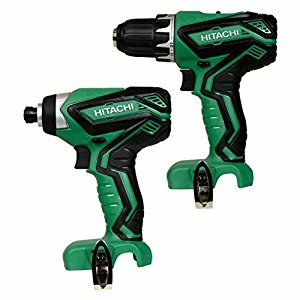 Here is the Hitachi KC18DGL 18-Volt Drill Driver/Impact Driver Kit where the drive ( DS18DGL) will show off its 400 in. lbs of torque inside its lightweight and ergonomic design weighing just 3.7 lbs. The impressive impact driver (WH18DGL) is also lightweight weighing only 3.1 lbs. while offering users a powerful 1280 in. lbs of driving torque for the heavier applications. We like the battery life that delivers 3x the charge compared to NiCd batteries. Q – Is the drill reversible? Q – Does the kit include driver bits? Q – Is the drill a 3/8 or 1/2 inch? Q – Are the tools variable speed? A – Yes! Trigger initiated. Q – Does it have a hammer setting on the drill? Here is the Milwaukee 2897-22 M18 FUEL 2-Tool Combo Kit that has the highest performing hammer drill and Impact Driver combo kit in today’s market. Included is the M18 FUEL 1/4″ Hex Impact Driver (2753-20), the top most powerful impact driver in its class. At 1800 in. lbs. of fastening torque, this impact drives screws fast yet also provides an efficient control over the power and speed due to its proprietary 4-Mode DRIVE CONTROL. M18 FUEL also includes the most advanced cordless technology currently offered, a POWERSTATE Brushless Motor, REDLINK PLUS Electronic Intelligence, and REDLITHIUM Battery Technology, delivering a much longer motor life, more run time and more power. A – Yes they are! Q – What is included with the kit? A – Case, bit holders, belt clips, and side handle. Q – Is the handle removable for when it’s not needed? A – Yes! The handle can be removed. Q – What is the difference between this tool and the 2797-22 model? A – The difference between the model 2797-22 combo and this one (2897-22) is the torque. In the 2797-22 combo, Hammer Drill peaks 725 in and Impact 1600 in. In the 2892-22 combo, Hammer Drill peaks 1200 in and Impact 1800 in. A powerful cordless drill can be one of the most necessary and useful power tools that you could ever have in your toolbox, and we’re here to help you find just the right one. We will highlight the various kinds of cordless drills available in today’s market plus explain the technology advances/operational/safety tips to get the most out of your cordless drill. Don’t focus on finding the drill that delivers the most power but more on how the drill feels when you’re using it. Batteries: Play a significant role in the effectiveness of the drill. Choose one that charges quickly and holds the charge for an extended period. Voltage: a Primary indicator for the power of a drill. Range from 6 up to 36 Volts. Models between 12-18 Volts are perfect for general use. Chuck Size: Determines how large of a drill bit the drill can contain. The two most popular sizes are 3/8″ and 1/2″. Drill speed: Are measured in rotations per minute (RPM). Check for a drill with an RPM range of 300-1,500 to handle a variety of tasks. Lower speeds: Ideal for driving screws and higher rates for drilling holes. 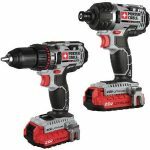 With many batteries offering longer runtime and quick charges your odds of finding a cordless drill with a terrific running battery is very high. Lithium-Ion Batteries: provide twice the performance and run four times longer than standard batteries. Longer Charge: Some chargers take several hours to recharge fully. Drill Kits: A lot of drills come with drill kits that include two batteries one being for backup while the other charges to increase productivity and reduce downtime while the other battery charges. The kits also contain the drill, drill bits, and hard or canvas carrying case. Picking the right drill size is an essential decision to make. Before you get excited to buy the biggest, most powerful cordless drill tool available keep in mind the long work day and the job sites you will be transporting the drill. You don’t want to be lugging around a heavy tool all day just because it had the most torque available. In the same token, you don’t need the most powerful for small DIY projects around the home. A 12v drill will be more suitable for a DIYer than an 18v – 20v that is meant for professionals. Battery Fully Charged: Begin every project with a fully charged battery in the drill and have a backup battery waiting in the charger to reduce downtime. Tool belt or holster: to keep the drill at your side when not in use during projects. Dead batteries: Take your dead batteries to your local hardware store for recycling. Torque: The higher the torque a drill has, the greater it will drill into much harder surfaces. Slower speeds: Use slower speeds for better torque and to prevent stripping screws.